Low Carb Pasta Announced from Isolator Fitness, Inc.
Isolator Fitness, Inc. has announced a new line of low carb, high-protein pasta available now on their website. 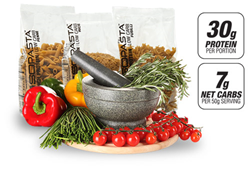 IsoPasta contains 30 grams of protein and only 7 grams of carbohydrates per 50 gram serving. Many individuals looking to lead a healthy lifestyle have decreased carbohydrate consumption and increased their intake of protein for a multitude of reasons. IsoPasta by Isolator Fitness has delved into this niche allowing those giving up their beloved pasta a chance to eat it once more, but without the high-carb repercussions. IsoPasta has 30 grams of protein and only 7 grams of carbohydrates per 50 gram serving--a ratio that had previously been practically unheard of. There are hundreds of protein options available to consumers, which is important because protein affects nearly every part of our bodies in one aspect or another. Muscles, bones, organs, skin, hair, and nails are all made from proteins and without the nutrient the body would not be able to function. Protein also helps to grow and repair muscles making walking, talking, moving, and interacting with the world around us possible. It’s surprising then that most average people do not consume enough protein needed to lead a healthy life. The recommended dietary allowance (RDA) for protein is just 0.8 grams per kilogram of body weight. Depending on how active your lifestyle is, this number may increase or decrease. But the RDA only accounts for the minimum amount of protein a person needs to eat to not get sick; it does not suggest that people should not eat more than this amount. For example, a 50 year old female leading a sedentary life and weighing 140 pounds (63.5 kilograms) would have an RDA of roughly 53 grams of protein. If she had 2 eggs for breakfast, a salad with tuna for lunch and pork for dinner, she would only have consumed 60 grams of protein for the whole day, which is just barely over her minimum necessary value. Adding in just one serving of IsoPasta to her dinner choice would push her up into the triple digits with 110 grams of protein for her daily intake, without significantly adding to her carbohydrate consumption; 110 grams of protein is a much healthier amount than 60 grams. When IsoPasta is compared to other protein options, such as pork chops, steak, tofu, white beans, and protein powders, chips and bars, it is the clear champion. It is packed with more protein, while also carrying less fat, carbohydrates, and calories. This is due to the fact that it is made with three different types of proteins: whey protein, pea protein, and isolated soy protein. A single serving provides an impressive 50 grams of protein, meaning that most people can fulfill their RDA with just one serving of IsoPasta per day, making all other protein consumption beneficial rather than just necessary. Protein is an essential nutrient that every single person needs. IsoPasta is a protein option that is compatible with so many different diets and soon it will include even more. Gluten-Free options are in the works, which will increase the dietary options exponentially. It is the perfect way for the average person to incorporate more protein into their daily diet, without having to do any sort of drastic overhaul on his/her normal dietary choices. By simply switching out a traditional whole-grain or processed white pasta with IsoPasta, you can increase your protein intake by as much as 700%, as most pasta choices offer (at best) 7 grams of protein per serving while IsoPasta offers 50 grams of protein in a single serving.